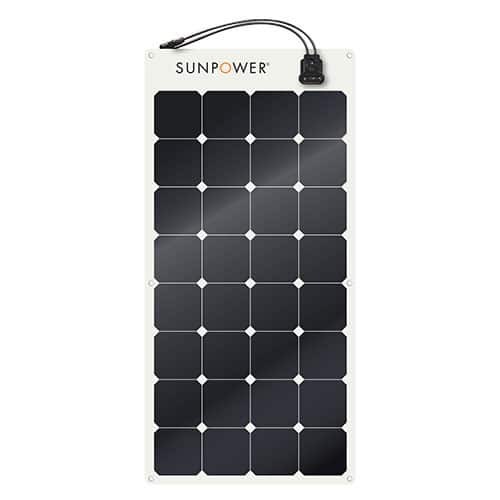 Made with SunPower’s highest power Gen II back contact cells, SunPower SPR-E-Flex 110 W Flexible Solar Panel deliver the highest power output and the highest charging capacity in their product class. SunPower panels are constructed with top-grade, light-weight polymer materials, allowing for easy transport, installation and panel flexing up to 30 degrees. Made with SunPower’s highest power back contact cells, SunPower’s flexible panels deliver the highest power output and the highest charging capacity in their product class. SunPower‘s panels are constructed with top-grade, light-weight polymer materials, allowing for easy transport, installation and panel flexing up to 30 degrees. The SunPower Maxeon® Solar Cell is the only cell built on a solid copper foundation. Flexible panels made with SunPower cells are resistant to power loss via cracking and corrosion. SunPower flexible panels are the #1 choice for customers due of the combination of high power and cell ruggedness. The panel can be installed with adhesives and/or use of stainless steel grommets in the panel. The panels have standard quickconnect cables. An easy-to-follow installation guide is provided with each panel. Warranty: 5 years limited power warranty of 80% of the minimum specified power rating. Designed in the USA. Assembled in France. SunPower Corporation, incorporated on May 25, 2004, is an American global energy company. The Company delivers complete solar solutions to residential, commercial, and power plant customers. Sunpower offers a set of residential solutions that deliver value to homeowners and its dealer partners. The American Company has developed to deliver alternating current (AC) panels with factory-integrated micro inverters. Join our ZERO Home Bills Community. The Best Solar Panels from the BEST Solar Brands at the BEST Retail Prices available in your market on ZEROhomebills.com by Solaranna. SunPower Corporation, incorporated on May 25, 2004, is an American global energy company. The Company delivers complete solar solutions to residential, commercial, and power plant customers. The Company offers a set of residential solutions that deliver value to homeowners and its dealer partners. The Company has developed to deliver alternating current (AC) panels with factory-integrated micro inverters. Join our ZERO Home Bills Community. The Best Solar Panels from the BEST Solar Brands at the BEST Retail Prices available in your market on ZEROhomebills.com by Solaranna.